Solarbabies. A box office mega-bomb that burned out in the 80s, but which we hope to revive today, so that modern audiences can warm to its cheesy (and multi-faceted) pleasures. Made on a budget of 26-27 million, this made back a mere smidgen of that, at best. And it was critically lambasted almost universally. However, it’s a future wasteland / post-apocalyptic movie. And we’re all about those, on the Really Awful Movies Podcast. It’s such an inane, yet fun, genre. Solarbabies refers to a gang of good guys…roller blading good guys…who compete in a post-apocalyptic sport not unlike lacrosse, called “skateball.” And to endear them to the public, the Solarbabies are…orphans…But it’s worse than that. They’re doomed to a labor camp life, under the jack boot and watchful eye of a bunch of evil no-goodniks called, The Protectorate. These guys control all the world’s scant water resources. And they’re mean and nasty. And it’s ultimately up to the Solarbabies, to try and get control of the water back, so that it can be more broadly distributed to what’s left of humanity. 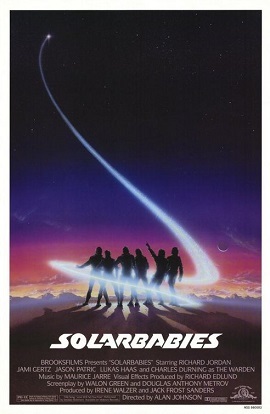 Why is this film called Solarbabies, you might ask? Good question. It’s about water. It should’ve been called Aqua Babies. But that’s neither here nor there. Solarbabies also features a deity of sorts…a glowing orb that has mystical powers. It bears many of the genre’s hallmarks, but is highly unique in that it’s very PG, has barely any violence, and is…pretty chaste.